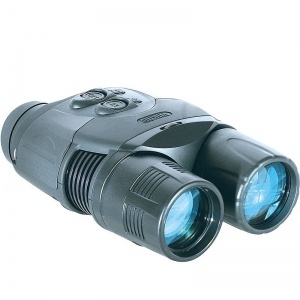 The Ranger Pro 5x42 digital night vision device is designed on the basis of the Ranger 5x42. In comparison to the standard Ranger a more sensitive CCD coupled with advanced SumLight technology gives greater viewing range of up to 500m (depending on atmospheric conditions) and a sharper image. The Yukon Ranger series pioneered digital night vision and its renowned performance and reliability has made them perennial best sellers. The combination of digital technology and high optical magnification offers flexibility and extended viewing ranges. As these models use a CCD sensor array instead of an image intensifier tube, they are not easily damaged by bright light sources, even daylight. A variable brightness/contrast control dial gives the freedom to adjust the LCD image screen to suit ambient light levels and personal preference. The Ranger models have twin built-in IR illuminator, a low power illuminator activates with power on while a near fully covert high power 940nm IR illuminator can be independently controlled for switching and intensity. Power comes from six AA 1.5v Alkaline/Lithium batteries (not included), the 12v Car Adaptor or the UK Mains Adaptor (both supplied). All models are supplied with a spare battery cradle to allow a quick change should it be needed. Also, a video out socket allows connection to remote devices or to the Yukon MPR Mobile Player/Recorder (supplied with the Ranger 5x42 MPR Kit or available separately) to record what you are viewing. A Whitworth thread on the base allows tripod mounting or the attachment of optional accessories. The durable sure-grip ABS plastic and rubber armoured main bodyshell is a stylish green and black on the Ranger 5x42 but all black on the Ranger Pro 5x42. The Pro model also features a more sensitive Sony CCD sensor array and together with the advanced Sum Light technology can extend viewing ranges up to 500m (depending on conditions). A multi function LED indicates "on" and "low battery" status as appropriate and the smooth objective and ocular focus is positive and responsive for a crisp sharp image. Each unit is individually serial numbered and supplied with a 12v Car Adaptor, UK Mains Adaptor, spare battery cradle, video adaptor cable, a detachable neck strap and stylish padded carry case. The Ranger 5x42 MPR Kit also includes all cables and accessories that are supplied with the MPR Mobile Player/Recorder.